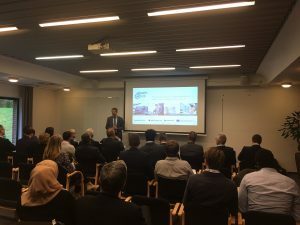 The IV eHealth Roadshow took place on 11 October at the Odense Congress Centre in the frame of the Week of Health and Innovation (WHINN), a renowned event in Denmark that brings together leading decision makers, experts, investors, buyers and sellers from across the healthcare industry. 3 main topics at WHINN 2017 were Connected Health, Sustainable Hospitals and Value-based Health and Care. 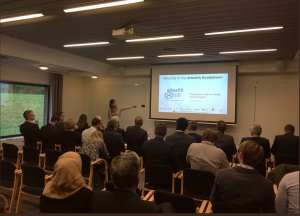 The eHealth Hub partners succeeded to select 9 European SMEs to pitch their solutions at the IV eHealth Roadshow in front of a committee of 9 experts in the eHealth field, including investors, hospitals, Scandinavian clusters and big industry. The most promising solutions had to prove the innovative high-end of their products, their maturity level, time-to-market of the new solution, inflection point and growth as well as internationalisation potential. The presented solutions were varied and included, among others, novel smart applications for skincare (melanoma prevention, sun exposure management or using DNA to create personalised skincare products), remote communication with healthcare professionals and patients-built workouts for joint or muscle pain. 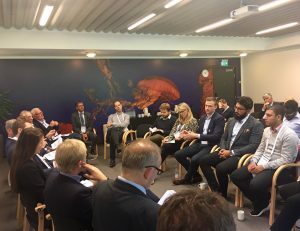 The committee was formed by a high-level group of representatives from investment (Welfare Invest, Converzion), big industry committed to healthcare innovation (IBM Watson, Oticon Medical), and regional organisations (The Region of Southern Denmark, Syddansk Sundhedsinnovation, ScanBalt BioRegion, Welfare Tech) and a hospital (Odense University Hospital) active in the eHealth field. After an exciting series of pitches and a lively Q&A round, SMEs and the committee members were able to engage in bilateral discussions and network with each other to discuss potential future collaboration opportunities. Mads Rasmussen (Committee member), CEO Welfare Invest. Thorbjörg Helga Vigfúsdóttir (SME pitch presenter), Kara Connect. 3) miiskin, app for skin and mole monitoring. The winners´ visibility will be boosted by Peter Frank, General Secretary of ScanBalt BioRegion, who will distribute the companies´ profiles among his network including 3000 companies, 50 University Hospitals, 50 health care clusters and networks and 75 health care sector science parks. The next eHealth Roadshow will take place in 2018 and will be announced shortly via our project website and social media channels (Twitter and Linkedin).